Decals are included for the black, and white, lettering on the model rocket. The kit includes a motor mount kit with plywood cluster centering rings, body tubes, sturdy coupler with baffle, bands, nose cone, pre-cut balsa wood fins and parachute recovery kit. There are three bands which go across the rocket's airframe to add detail to the model. Small rectangles glued on the pre-cut fins, to add even more detail. 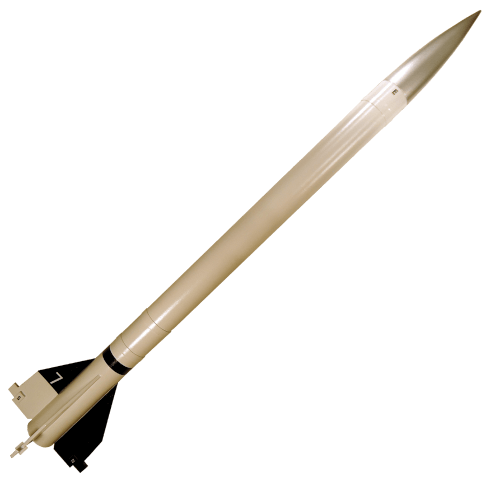 The Viking sounding rocket family was developed by the US to provide a better vehicle than the German V2. In the 1950's, several of the Viking rockets were designed and flown by the US Navy. As part of a scientific mission, the Viking 7 climbed to 136 miles, and beat the altitude record of the V2. The semi-scale model flies to more reasonable altitudes on a cluster of 2 model rocket motors. Try two B's for a smaller launch site, or go wild with two C motors.